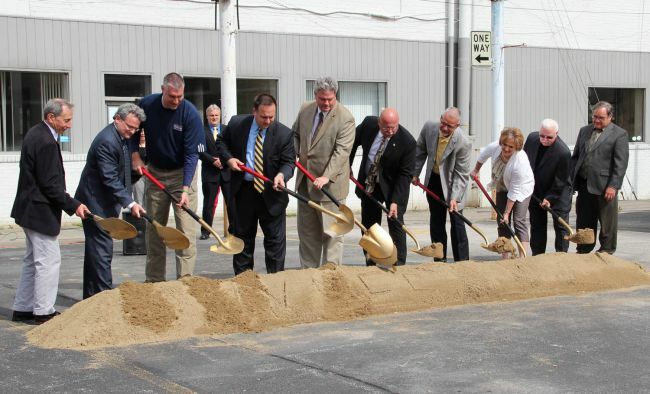 Groundbreaking ceremonies were conducted the afternoon of Wednesday, May 9, for the $3.88 million construction project that will turn a former downtown Wheeling auto showroom into the Applied Technology Center for West Virginia Northern Community College. Olshinsky and Steve Lippiello, the college’s vice president of administrative services and chief financial officer, said construction crews will be on the job within the week. “The project is scheduled to be completed in March of next year,” Lippiello said. Eight contractors supplied bids for the project. Low bidder was DeSalvo Construction Co. of Hubbard, OH. “DeSalvo will begin bringing equipment and materials onsite the week of May 14 and demolition work on the building will begin the week of May 21. Demolition is expected to take approximately six weeks,” Lippiello said. SMG Architects of Wheeling designed the project. First floor of the building will house labs for welding, diesel and refrigeration/heating/air conditioning instruction along with a large classroom and offices. The second floor will include a multi-purpose classroom, a second classroom and the lab for Mechatronics, a new program that prepares students to be electrical and industrial maintenance technicians. Mike Koon, Northern’s vice president of workforce development, said SMG Architects designed façade work for the structure to complement the college’s B&O Building nearby as well as the historical West Virginia Independence Hall located across Market Street. Koon pointed out that Northern’s Weirton campus just opened a new addition that also houses Mechatronics, a move that has been eagerly anticipated by students there. On Feb. 24, 2011, WVNCC’s Board of Governors approved a resolution calling for purchasing the three former car dealership parcels in downtown Wheeling for $1.05 million. Then in August documents were signed officially turning over the property to the college from the Ohio County Development Authority. Funds for the purchase and renovation will come from state bond money approved by the Legislature in 2008. The college's current facilities include the B&O Building, situated across the street from the former car dealership, and the Education Center, the other main college building, across Chapline Street from the B&O Building.